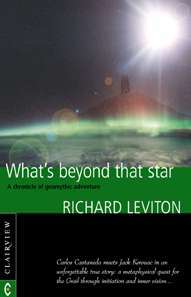 What's Beyond That Star records the true story of Leviton's spiritual awakening and his subsequent adventures on a metaphysical search for the Holy Grail, tracing his inner and outer journeys during a remarkable summer. Guided by a psychic friend and the family of angels whom he comes to know as 'Blaise', Leviton finds himself initiated into new realms of consciousness. With little warning, a panorama of spiritual entities and previously unknown dimensions become visible to his inner eye. One day he is an ordinary person relying on the relatively dense perception of the five senses, the next he is living in a world full of angels, gnomes, demons and dragons. RICHARD LEVITON has been interested in angels and mythology since an early age, and he is a frequent visitor to the British Isles. The author of 8 other books, including The Galaxy on Earth: A Traveler's Guide to the Planet's Visionary Geography (2002), Leviton has been a professional journalist for 25 years, having published hundreds of articles in the fields of health, natural medicine, ecology, psychology, and spirituality. He has also edited a national magazine on alternative medicine, and more recently - in his professional capacity as Senior Editor for Hampton Roads Publishing Company in Virginia, USA - he has developed a line of innovative alternative medicine self-care titles as well as authoritative metaphysical books.